The most obvious problem in inter-racial communication is the language difference. All the major races in EVE speak their own language and all attempts to make one the lingua franca have failed because of stubbornness over accepting any one language as the dominant one. Amarish, the language of the largest empire, is obviously the most common language, especially as most Minmatars also speak the language. But the Gallenteans refuse to acknowledge Amarish as the official language in inter-racial communications as they don’t want to give the Amarr Empire the political prestige that would follow. On the other hand, the language of the Gallente Federation (Gallentean) is by far the most common second language, largely because of their very influential entertainment industry. But the Caldari absolutely refuse to speak Gallentean and the Amarrians are also not too keen on it for the same reason that the Gallenteans won’t speak Amarish. This means that most high-profile discussions between representatives of the empires, such as in the numerous inter-racial organizations, rely heavily on interpreters. But in one field the language a person knows has become irrelevant and the field is that of a space captain. 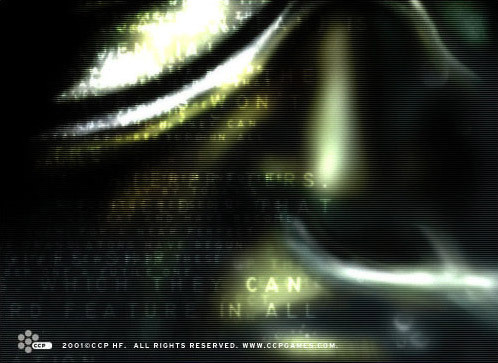 The unique nature of the capsule with its sophisticated neural rigging gives ship captains the option to link their minds to all kinds of computer systems, which they can use to their advantage. One of these devices that is today a standard feature in all capsules is the translator module. The translator module is a software module that is a part of the communication system of the ship. It intercepts all incoming communications and translates them into the language preferred by the captain. The first translators were pretty lousy by today’s standard, they could only translate written communications and frequently messed up the text. But the latest versions are able to translate voice as well as text and have become very good at projecting mood-swings, slang, weird accents and such, for a near perfect translation. With the steady increase in cyber-implants these translators have begun appearing outside the capsule as well and many predict that within a few years translators will make the debate over which language should prevail in inter-racial communication a futile one.